Out this week on DVD is the captivating documentary, Trumbo. Based on the play by his son Christopher Trumbo, it should more accurately be called a docudrama. It looks at screenwriter Dalton Trumbo's fall from grace after his refusal to name names in front of the House Un-American Activities Committee, which was investigating Hollywood for its ties to the communist party. At one time, Trumbo (Kitty Foyle) was one of the highest paid screenwriters in Hollywood. But the political atmosphere grew increasingly paranoid in the face of the ascension of the Soviets to the status of superpower. And many Hollywood liberals were targeted for their membership in the communist party during an earlier time when Russia was a US ally. Trumbo was one of the Hollywood Ten, ten writers and directors who refused to give up other members on the basis of the freedom of speech provision of the First Amendment. He was found in contempt of Congress, sent to prison for close to a year, and was blacklisted in Hollywood. After some lean years during which he had to support his family by writing screenplays under various pseudonyms, his name was once again allowed onto the credits of a film in Spartacus (1960), and Exodus (1960) soon after. In 1975 (one year before his death), he would go on to accept an Oscar for his story for The Brave One (1956), an award never picked up in 1957 because he had written it under the pseudonym Robert Rich. And in the nineties, records would later be changed to reflect him as the winner for Best Writing, Motion Picture Story for 1953's Roman Holiday. Trumbo cleverly supplements the traditional home movies, still photographs, present day interviews, and archival interviews with the subject one usually sees in these types of films, with dramatic readings of the screenwriter's numerous personal letters as read by prominent actors. Famous faces like Michael Douglas, Joan Allen, Liam Neeson, and Donald Sutherland each bring their own distinct style to their first-person readings as Trumbo. The most comical is Nathan Lane's reading of a letter from Trumbo to his son, an ode to the freedom he hopes his son feels when masturbating, a freedom that he never felt growing up in his time. The whimsical musical score by Robert Miller should also be noted here for reflecting the impish nature of Dalton Trumbo, a man whose wit and sarcasm could cut almost any enemy down to size, as some of the readings demonstrate. Through each reading and the appropriately paired documentary footage, one gains a greater understanding of not only the political trials, but also the practical economic ones that Trumbo faced in providing for his family during the oppressive era of the Red Scare. 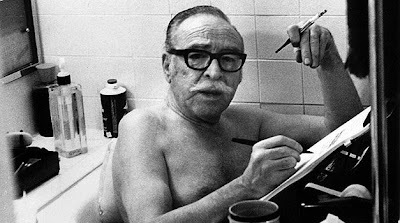 Given the current paranoia in the world of politics, Trumbo proves to be a timely primer in weathering such a storm, and its DVD is well worth seeking out. Just watched this doc (on instant Netflix) and I was a bit disappointed. I liked the idea of having people read his letters, but other than Joan Allen (who probably had both the best delivery and the most compelling letter to deliver) and Nathan Lane, most of the deliveries were vaguely irritating. I did not find the structure of the documentary very satisfying either; I would have liked a stronger sense of the development of Trumbo's life over time - that said, the second half was much stronger for me than the first. Also, I found the historical context severely lacking. Trumbo was in fact a member of the Communist Party, a fact the movie never acknowledges - and he even "named names" during WWII, voluntarily turning over to the FBI letters which requested an out-of-print antiwar book by him. Because it takes this approach (which is both historically limited and, frankly, dramatically less interesting) the movie misses a fascinating opportunity to examine the contradictions and motivations in the political disagreements of the time. Instead, it's all turned into a black-and-white morality play; only the occasional anecdotes from Trumbo (like that generous speech quoted in the beginning of the film) add the necessary dash of gray. It's as if the film was under the impression that it had to simplify Trumbo (they talk a lot about how complex he was, but they never really demonstrate it) to make him palatable and his persecution objectionable. Untrue in both cases. Allow me to watch this again before I respond. It's been a while since I saw it, and I don't remember having the same misgivings. But that may be because I knew Trumbo's story well going in, and probably didn't concentrate on what was missing contextually.